To understand Saint Thérèse and to fully appreciate her humility, holiness and wisdom, it is important to understand how her autobiography came about. Saint Thérèse, at that time Sister Thérèse of the Child Jesus, began to write her story when she was twenty-one years of age, just three years before she would go home to Heaven. She began to write out of obedience to Mother Agnes of Jesus, the superior of their Carmelite convent in Lisieux. “One evening in the beginning of the year 1895, I was with my two sisters Marie and Thérèse. Sister Thérèse of the Child Jesus told me several happenings of her childhood and Sister Marie of the Sacred Heart (my eldest sister Marie) said to me: ‘O Mother, what a pity that all this should not be written down for us. If you were to ask Sister Thérèse to write down her childhood memories, how much pleasure this would give us!’ …I turned to Sister Thérèse, who laughed as though we were teasing her, and said: ‘I order you to write down your memories of your childhood'” (Affidavit by the Reverend Mother Agnes of Jesus. Bayeux Archives, Vol 1). This background helps to illustrate that the wisdom contained in The Story of a Soul is not a scholarly work produced from many years of study, nor is it a carefully worded autobiography written for the whole world to read. Rather, it is an intimate and personal sharing of one simple soul with her most beloved sister. Thérèse and Pauline had a holy bond that exceeded even the ordinary relationship sisters often share. This bond was deepened with the loss of their mother when Pauline was fifteen years old and Thérèse was only four. Soon after that painful loss, Thérèse declared that her sister Pauline would now be her “new mother.” For the next several years, Thérèse and Pauline were very close and shared a beautiful sisterly love. Pauline also showered Thérèse with a mother’s love. The two sisters were inseparable, and Thérèse regularly bared her soul to her new mother Pauline. Fifteen years after the death of their mother, Thérèse received Pauline as her spiritual mother in a new way when Pauline became Mother Agnes in the Carmelite Convent. It was, therefore, to her dear sister and second mother that she began to write the story of her soul and thus began to entrust this beautiful story to the whole world. Reflection: Oftentimes in life we present ourselves in an exaggerated and misleading way. This tendency is a result of our fear of being judged by another. But imagine if you could share the story of your soul with someone else in a completely carefree way! How would your story read? Thérèse wrote in a carefree, trusting, open, and honest manner. She never expected that her memoirs would be read far and wide and declared one of the greatest spiritual gifts to the Church of all time. Rather, she wrote her story for one who knew her and loved her unconditionally. The story behind the Story of a Soul is important because it teaches us about trust and honesty. It illustrates the intimacy that we are called to live with others, as well as the fruit of that unconditional love. Do you have someone in your life with whom you can entrust the intimacy of your soul? Whom do you trust enough to do the same? Seek to build relationships of love that are so deep that you can confidently share the content of your soul. Dearest Saint Thérèse, you were privileged to bare the depths of your soul with your dear sister and mother in an intimate and open way. You loved her and were loved by her; you trusted her and were trusted by her. Pray for me, that I may express my unconditional love to others so clearly and unwaveringly that I will become a confidant and friend as God desires. Pray that I will have a heart that is honest and trustworthy, one that is caring and compassionate, and one that is merciful and faithful. Saint Thérèse, pray for us. I understood that every flower created by [God] is beautiful, that the brilliance of the rose and the whiteness of the lily do not lessen the perfume of the violet or the sweet simplicity of the daisy. I understood that if all the lowly flowers wished to be roses, nature would lose its springtide beauty, and the fields would no longer be enamelled with lovely hues. Thérèse also understood “that God’s Love is made manifest as well in a simple soul which does not resist His grace as in one more highly endowed.” Not everyone could be a rose; otherwise, the diversity of souls would be lost and the unique beauty of each would not stand out, manifesting the beauty of God in its own unique way. Some souls are like “field flowers.” These lowly and simple flowers reveal a particular charism in that God shows His infinite greatness by stooping down from Heaven to bestow His grace upon them. It is through these simple and humble souls that God’s profound love is made most evident. Most people are created by God to be simple and hidden among the masses. But God sees the beauty of every soul He creates, even if the world fails to perceive it. Each “flower” is radiant to Him, and He chooses to descend to each soul He has created so as to manifest His glory through them. Reflection: At times we all feel as if we are unimportant. We lose focus on the uniqueness of our own lives and fail to see our own inner beauty that was placed there by God Himself. Know that God has descended to you and desires to bring forth the beauty of your soul. Know that you delight Him and He sees you, loves you, and accepts you as His little child. Your soul becomes truly beautiful the more fully you embrace His perfect will, in small and great ways. Accept who you are and become who you were made to be by allowing yourself to become conformed to His perfect will. In doing this, you will shine forth as the beautiful “flower” you were made to be. Dear Little Flower, Saint Thérèse, I thank you for your simplicity and humility. Thank you for the example you set forth when you allowed the great Almighty God to descend into your soul and shine forth in radiant beauty for all to see. Pray for me, that I may also open my soul to the glory of God and allow Him to live within me, shining forth for all to see. Saint Thérèse, pray for us. Lesson: Thérèse shared with her sister that her “soul has been refined in the crucible of interior and exterior trials.” Thérèse did not simply say that she has suffered greatly in her life. Rather, she immediately links both her interior and exterior suffering of the past to the refinement of her soul. Thérèse saw suffering through the lens of God’s purifying grace. She discovered in her suffering the gift of transformation and holiness. Thérèse suffered in various ways throughout her short life. She suffered greatly at the death of her beloved mother when she was only four years old. Again, she experienced the pain of loss at age nine when her older sister and “new mother” Pauline entered the Carmelite convent. In school, Thérèse suffered what many children undergo when she was teased and mistreated by her classmates for being different. She was naturally very sensitive and scrupulous and this caused her much interior anguish. She also suffered physical illness as a child, as well as in the last year of her life. Especially as a young nun, Thérèse suffered great darkness in her soul, which is a common experience for those who draw exceedingly close to God. This “darkness” is best described as a loss of all interior consolation and a sense that God is absent. But this darkness was a gift given to her by God to strengthen her faith and to enable her to choose the will of God for the sake of love alone and not for the reward of consolation. At age twenty-one, Thérèse described herself as “a flower after the storm.” She went on to share that all she suffered enabled her to blossom and radiate the love of God. And throughout every “storm” she endured, the Good Shepherd was with her, walking by her side, leading her to the depths of His divine love. Reflection: What is it that you suffer? Perhaps the loss of a loved one or a broken relationship is the cause of much anguish in your life. Perhaps you are misunderstood by another, misjudged, ridiculed, or mistreated. Perhaps you suffer from depression, loneliness, or another form of interior darkness. If any of the above describes you, know that, just like Thérèse, God wants to strengthen you through your trials. This is a difficult lesson to understand and even more difficult to accept. But God is all-powerful and is able to use every storm in life to bring nourishment and strength to your soul. When you experience the hardships of life, turn your eyes to “the flower after the storm.” Allow yourself to understand how God can use your suffering to strengthen you and know that He never leaves you during your trials. He is the Good Shepherd and walks through every dark valley you tread. Make an act of faith and love in the midst of your darkness and look forward, with hope, to the day that the sun will shine upon the flower God is nourishing within you. Dear Saint Thérèse, God’s Little Flower, you beautifully weathered the storms of life. Pray for me, that I may be filled with divine hope and that I may imitate your great faith and love so that I, too, will be “refined in the crucible of interior and exterior trials.” May your prayers and witness help to mold me into the splendid flower God desires me to become. Saint Thérèse, pray for us. Lesson: Many of the great saints have written about the importance of humility, calling it the “mother of all virtues.” Humility is best defined as knowing and believing the truth. More specifically, it’s knowing the truth about ourselves. Oftentimes, those who are proud exaggerate their actions and seek to magnify the appearance of their virtue. But sometimes pride can manifest itself in the form of a false humility that keeps us from seeing all the good that God has done in our lives. If a little flower could speak, it seems to me that it would tell us quite simply all that God has done for it, without hiding any of its gifts. It would not, under the pretext of humility, say that it was not pretty, or that it had not a sweet scent, that the sun had withered its petals, or the storm bruised its stem, if it knew that such were not the case. True humility does not lead us to hide the truth of the goodness and glory of God alive within us. Rather, it rejoices in the abundant blessings we have received, proclaims those blessings in gratitude to God and gives God the glory for all that He has done. True humility enables us to see not only our sin, but also our virtue as we recognize the one source of all virtue: our merciful God. Reflection: When you look at your soul, what do you see? Do you struggle with a poor self-image? Or do you carry an inflated and false image of yourself? The only image you should see is that which God sees. When God looks at your soul, what does He see? Certainly He sees your sin. But if you are willing to look at your sin with honesty and contrition, then your contrition will overshadow your sin in the eyes of God. He will look past your sin so as to gaze upon the many virtues He has planted within you. Perhaps you too will learn to look beyond your sin and see your virtues as God sees them, rejoicing in their beauty and giving glory to God for His abundant mercy in your life. Dearest Saint Thérèse, you were showered with an abundance of virtue on account of the abundance of your humility and love. God transformed your inner heart into a place of true beauty and manifested His glory for your eyes to see and for you to share with a world in need. Pray for me, that I may imitate your humility and seek to see not only my sin, but also the hand of God at work within me, making me into an image of Himself. Saint Thérèse, pray for us. Baby is the dearest little rogue; she comes to kiss me, and at the same time wishes me to die. “Oh, how I wish you would die, dear Mamma,” she said, and when she was scolded she was quite astonished, and answered: “But I want you to go to Heaven, and you say we must die to go there”; and in her outburst of affection for her Father she wishes him to die too. Lesson: The above passage comes from a letter written by Thérèse’s mother and sent to Pauline, Thérèse’s older sister, when Thérèse was around three years old. At this early age, Thérèse had a deep affection for her mother and her father. She was with them constantly and never wanted to be parted from them. But her affection for them was not selfish. Young Thérèse with piercing wisdom, realized that Heaven was what her mother and father were made for and where they would find perfect joy. Therefore, this faith-filled child desired that her parents would die so as to obtain the glories of Heaven. Thérèse shows us that true love always seeks the good of the other. Though she deeply desired to be in the presence of her parents, she desired their happiness more than her own. This is love in a selfless form and is beautiful and profound wisdom from a little child. Reflection: Whom do you love with such an unconditional love that you want that person’s happiness above your own? Is your love of others often based on selfish motives, or are you able to turn your eyes to the good of those whom you love and make their holiness and happiness the sole desire of your love for them? Additionally, on a personal level, do you see Heaven as the greatest good in life and the goal of everything you do? When we can look beyond the temporary nature of this world and peer into the realm of eternity, our perspective here on Earth will be changed. We will no longer live for the moment, seek passing satisfactions, or act in selfish ways. When Heaven is our focus, the present moment and all the daily decisions we make will take on new meaning and clarity. Make Heaven your one and only goal for you and for those whom God has placed in your life. Allow this eternal perspective to become the basis of all you desire and of all your decisions in life. 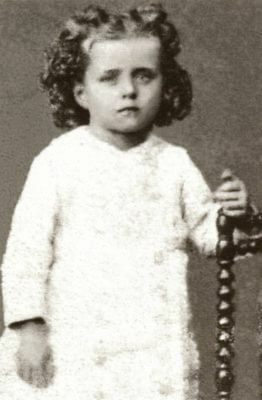 Dearest Saint Thérèse, you longed for Heaven for yourself and for your parents with a burning desire. Pray for me, that I may also embrace this eternal longing. May your witness inspire me to set all passing joys aside for the one eternal joy that awaits us all. Saint Thérèse, pray for us. Lesson: One day, Thérèse asked her mother if she, Thérèse, would go to Heaven. Her mother replied, “Yes, if you are good.” Thérèse was pleased to hear this but also immediately realized that if she were not good she would go to Hell. However, this possibility did not shake her childlike confidence. She immediately decided what she would do if she were sent to Hell. She told her mother, “I shall fly to you in Heaven, and you will hold me tight in your arms, and how could God take me away then?” Her simple logic was based on her confidence in both the love of her mother and the mercy of God. Thérèse knew she could cling to her mother, no matter what, because she had always experienced unconditional love and acceptance from her mother. She also knew that her mother would be in the presence of God, no matter what, because she knew her mother had a profound goodness within her soul and a deep closeness to God. Thérèse’s confidence in God was also a confidence in the love she gave to and received from her dear mother. Reflection: Many people struggle with confidence. This is often on account of their fear of what others think of them and because of the fact that they have never experienced the unconditional love of another. If that is you, ponder the love that Thérèse received from her mother. Make her experience a lesson by which you allow your own confidence in God to grow. The truth is that God loves you just as much as He loved little Thérèse. And if Thérèse could have the utmost confidence in the mercy of God by entrusting herself to her mother’s arms, then so must you seek to have the same confidence. Turn today to the loving arms of our Blessed Mother. Her love for you is, indeed, perfect in every way. Just as Thérèse was confident that God would shower mercy upon her if she clung to her earthly mother, you can have confidence in that same mercy if you cling to your Heavenly Mother. Run to her in faith and seek to develop the deepest of confidence in her maternal care. This confidence will enable our Blessed Mother to hold you tightly and present you to God as her precious child. Dearest Saint Thérèse, you had confidence in the mercy of God because you experienced that profound gift in your relationship with your earthly mother. Pray for me that I may have that same confidence in the motherly care and intercession of our Heavenly Mother. Dearest Mother Mary, receive me into your maternal arms and present me to your Divine Son, Jesus. Saint Thérèse, pray for us. Lesson: One humble quality of Saint Thérèse was that she was not afraid to admit her sin. She knew she failed to love in a perfect way, and she was regularly aware of her weakness. Too often in life, when we fall short of God’s glory, we tend to justify our actions and deny our sin. We become self-righteous and obstinate in admitting our guilt. Thérèse was different. She never hid her sin or weakness. 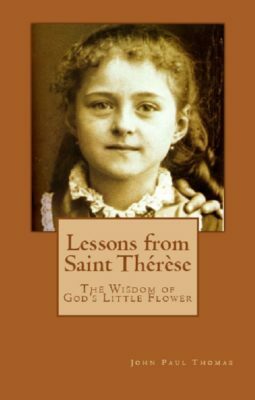 Her mother identified this quality when she said of her little saint, “The moment she has done anything mischievous, everyone must know.” Whether she fought with her sister, was negligent in some duty, or acted in a way that was rude, Thérèse not only immediately felt sorrow for her sin, she also admitted it openly and apologized profusely. One reason Thérèse was so willing to admit her sin was that she trusted in forgiveness. She experienced a profound level of forgiveness from her family and, through them, discovered the forgiveness of God. By having full confidence in the gift and transforming power of forgiveness and reconciliation, Thérèse regularly ran to this gift, fully expecting to receive it from whomever she asked. Reflection: How do you approach sin in your life? You are a sinner, that is a fact. Are you able to admit this with honesty and ease? If it is difficult to admit that you are a sinner, then step back and look at the merciful Heart of our God. It is impossible to see our sin, admit our guilt, and repent of what we have done unless we are aware of the merciful Heart of God. God does not desire your condemnation or punishment. Instead, He longs for you to be free of the burdens that your sins cause. If you can start with this understanding of forgiveness and God’s abundant mercy, fear of confessing your sins openly will be alleviated. Allow your confidence in God’s mercy to grow so that you, like Saint Thérèse, will repent the moment you fall short of God’s glory and turn back as soon as you stray from His perfect will. Building a habit of immediate repentance will lighten the heaviest burden you could carry in life. Dearest Saint Thérèse, I thank you for the holy witness of your sorrowful heart. You did not hesitate to admit your sin and to seek the forgiveness of others. You understood the mercy of God and sought that mercy from those whom you offended. Pray for me, that I may seek the same freedom you experienced by your humble contrition. Saint Thérèse, pray for us. Lesson: Charity must be the central mission of every follower of Christ. Charity is an act of supreme selflessness by which we are called to rely upon grace to put the good of another before ourselves. It’s selfless and self-giving. While charity is a supernatural grace from God, made possible only by the death and resurrection of Jesus, there is another form of love which is also very powerful. This love may be called “natural love.” Natural love is greatly helped by grace (charity) but is distinct in that it’s more of an affection or attraction to something good. When natural love is experienced in a relationship, then the attraction is to the person who is innately good. When natural love mixes with supernatural charity, one not only fulfills the central Christian mission of laying down one’s life for another, but also receives the profound gift of the love and affection of another. This natural love takes place in spousal love but also extends to other family members and friends. Saint Thérèse experienced this form of natural love to a profound degree within her own family, and especially with her sister Pauline. On many occasions, while Pauline had been away at boarding school, Thérèse’s mother would ask her young daughter, “What are you thinking about?” As Thérèse sat quietly pondering in silence, her answer was always the same, “Pauline!” The natural sisterly bond that Thérèse and Pauline shared was the source of much human satisfaction. When Pauline was not around, Thérèse felt her absence. This is natural love and human affection as God designed it to be lived. Reflection: Do you have human friendships that are the source of much satisfaction and fulfillment in life? Too often, our affection for others becomes distorted and selfish, contrary to the natural design of God. But when supernatural charity is infused into a relationship, and when both persons love with the grace of God, a powerful and holy natural bond is also formed. Reflect upon the holy friendships you have had in life that have produced an abundance of satisfaction and fulfillment. If these friendships are centered in Christ, then you can be assured that the satisfaction you experience is a result of the natural fruit of God’s design of human love. On the contrary, when a relationship causes much hurt in your life, step back and examine your side of the relationship to be sure that your sin is not depriving you or the other of the natural blessings of your shared love. When love is holy, it is also deeply satisfying. Allow the good fruits of your friendships to guide you into a greater experience of the gift of human love. Dearest Saint Thérèse, your sisterly affection for Pauline was a true gift from God. The fruit of that holy bond is an inspiration to all who seek to deepen their love for others. Pray for me, and for all families, that the love shared in my life and in every home may always achieve the natural end that was intended by God. May your witness, and that of Pauline’s, inspire us and lead us to a deeper love and affection for all whom God places in our lives. Saint Thérèse, pray for us. Lesson: Parents know their children in ways that only they are capable of knowing. In fact, observant and dedicated parents will often know their children better than their children know themselves. Such was the case with Thérèse and her mother. Thérèse’s mother was aware of a certain self-love, as well as a stubborn streak, that Thérèse had as a child. But she was also aware that Thérèse responded contritely when confronted with her shortcomings and quickly changed from self-love to virtue. The lesson was not lost on Thérèse. She never forgot about this gentle invitation from her mother and eventually realized that her mother was only helping her to see her own need to grow in humility. It takes a caring mother to teach such a subtle lesson to her daughter. But Thérèse was a good learner, and this small challenge to her pride enabled her to see this tendency toward pride and overcome it quickly. Reflection: When someone challenges your pride, offers a gentle correction, or highlights your sinful tendencies, how do you respond? It’s so very easy to initially respond like Thérèse did, with defiance. But even if you do find that initial tendency within you, seek to imitate Thérèse by letting the lessons others teach you to sink in. When the words of another bothers you in some way, do not react with anger, self-will, stubbornness or pride. Rather, allow that person’s words to be the source of your own examination of conscience. Even if a comment or correction is very slight, be attentive to any initial negative reaction on your part. Very often, what bothers you the most is more on account of your own sin than it is on account of the judgmentalness or rudeness of another. In fact, what you perceive as another’s sin might not be sin at all. It might be love, given to you in the form of correction and guidance. Don’t miss out on these subtle, or even not so subtle, acts of love God gives you so can grow in virtue. Dearest Saint Thérèse, you were greatly blessed by a mother who loved you dearly. She loved you with such a powerful love that she was willing to offer you even the smallest correction when you needed it. Pray for me, that I may receive all correction with love and humility. May I imitate your willingness to listen and change when I am invited to do so by the love and care of others. Saint Thérèse, pray for us. For a child of three to understand the power of small sacrifices and to intentionally make them time and time again is more than inspiring. This shows how serious Thérèse was about loving God, and it points to her wisdom in that she comprehended the value of sacrifice. It also reveals that she put this wisdom into action by trusting that God would receive every sacrifice she offered Him. Thérèse’s habit came about because her older sister Marie gave her beads to count her sacrifices. Once again, we see that Thérèse was easily formed in the ways of God and responded to the loving guidance given to her by her family. She lived in a school of faith and love. Reflection: How aware are you of the power of small sacrifices? It could be said that small acts of love are not just important, they are everything! We are rarely called to make huge sacrifices, requiring heroic acts of love. Opportunities to make small acts of love in the form of small sacrifices occur every day, however. Make it your goal to acquire a permanent habit of small sacrifices. A habit can only be formed by doing these sacrifices day after day, week after week, and year after year. The more you offer sacrifice, the more you will want to sacrifice. And the more you want to sacrifice, the more you will become an instrument of sacrificial love. Dearest Saint Thérèse, you learned from a very young age about the power contained in small sacrifices of love. Pray for me, that I may also be as open as you were to these lessons of love. Help me to form a deep habit of self-giving so that I may become the saint that God is calling me to be. Saint Thérèse, pray for us. Lesson Eleven — I Choose Everything! My God, I choose everything, I will not be a Saint by halves, I am not afraid of suffering for Thee, I only fear one thing, and that is to do my own will. Accept the offering of my will, for I choose all that Thou willest. Thérèse realized that being lukewarm in her faith was not an option if she were to become a saint. If she were to achieve the sanctity that she desired, she would need to allow her own will to disappear so that only the will of God would remain. “Not my will but yours be done” (Luke 22:42). She also realized that by surrendering fully to the will of God, she would encounter suffering in life. But suffering, when it comes as a result of doing the will of God, is not something that should cause us fear. Rather, suffering must be fully embraced as a consequence of walking in the footsteps of Jesus. Thérèse’s desire was to live out the will of God to the greatest extent possible, no matter the cost. Reflection: Are you willing to choose everything contained within the will of God? Are you willing to let go of your own will, your own ideas and your own preferences so that only God’s will can be done in your life? At first, this sounds like a good idea, and many will respond with a clear, “Yes.” But don’t answer that question too quickly. Ponder first the “consequences” of choosing everything contained within the will of God. This choice is radical, total, and requires the utmost sacrifice of your life in imitation of Jesus. What might God ask of you? How hard will it be to say “Yes” to every detail of God’s perfect will? Saying “Yes” to God will be painful in that it will have the effect of purifying you of all selfishness and sin. It hurts to be purged, but it’s the only way to holiness. Say “Yes” with Saint Thérèse and continue to choose everything in imitation of her example. Whatever suffering you endure on account of this choice will produce blessings a hundredfold. My dearest Saint Thérèse, you did not hesitate to say “Yes” to God with all your strength. You chose everything contained within His will and rejected all that was contrary to it. Pray for me, that I may not hesitate in doing the will of God for my life. If I suffer, help me to know that every sacrifice I make will be repaid by God in ways beyond my imagination. Saint Thérèse, pray for us. Lesson: When Thérèse was a child, she had a dream of two hideous little devils dancing on a barrel in the garden. When they saw her, they ran from her and hid. In her dream, she overcame her initial fear and pursued the devils to see what they were doing. When she found them, she discovered that the frightful little devils were actually hiding out of fear of her! Thérèse realized that the evil one is real, hideous and vile in every way. However, she also realized that when one’s soul is in a state of grace, the evil one cannot inflict harm upon it. Therefore, the devil fears those holy souls who do battle with him by their sanctity of lives. Reflection: What do you fear in life? The evil one is a master at causing irrational fear in our lives. But the truth that we learn from little Thérèse is that when we live a life of holiness, the evil one is far more fearful of us than we are of him. This may be a hard lesson for many to learn. Most people do not think of the evil one very often, and that might be good. But take a moment to think about this hideous creature. The evil one hates you with a perfect hate. He desires only your utter destruction and eternal death. If this is disheartening and discouraging to think about, then ponder also the fact that this hideous creature has no power over you unless you allow him to have that power. And the only way you allow him to have power over your life is by sinning. When you sin, especially when your sin is grave and unrepented, the evil one is able to have his way with you. He will inflict upon you feelings of hate, envy, lust, selfishness and the like. He will distort your passions, confuse your thinking and lead you astray. On the contrary, when you seek to eliminate all sin from your life, the Holy Spirit alone takes possession of your precious soul. Within your soul, He places mercy, kindness, gentleness, self-control and the like. Therefore, the devil is defeated within a soul who is immersed in the grace of God. Dearest Saint Thérèse, you did not fear the evil one in your life because your love of God was so deep that the evil one had no power over you. Pray for me that I may turn from all sin in my life and may be freed of the many snares and enticements of the devil. Place in my heart, through your prayers, the many fruits of the Holy Spirit so that I will walk in the presence of God, free of all fear and all sin. Saint Thérèse, pray for us. Lesson: Our human nature is the starting point for all virtue. Unfortunately, Original Sin has severely disfigured our human nature, leaving us with physical, mental, emotional and moral defects. The moral defects we experience come from what we call concupiscence, which is the disordered tendency we experience toward sin. Some people struggle deeply with various natural disorders, while others appear to struggle far less, having what appears to be many natural gifts of intelligence, personality, self-control and the like. God knows the “starting point” that each one of us has and will judge us accordingly to the degree that we allow grace to build upon our nature. This is a great natural blessing she discovered within herself. Most people rebel strongly if they are unjustly accused and react with much distress, emotion and passion. But Thérèse had such a wholesome nature that she admitted she did not earn any “merit” from her ability to humbly accept unjust accusations. It was simply part of who she was, naturally speaking. Though Thérèse’s natural humility was great, she did allow grace to build upon her natural gift so as to bring this virtue to greater perfection. As she did this, she also earned much merit in the eyes of God. Thérèse also spoke about her “naturally happy disposition” which “helped to make life bright.” Again, this natural gift of a happy disposition no doubt made not only her life bright but also had a wonderful effect on others. Reflection: What are your natural gifts? Perhaps they are different from what Saint Thérèse manifested, but you do have natural gifts that stand out above the rest. Very often, we rely upon our natural gifts and use them for good. But it’s also likely that those who have many natural gifts will fail to allow grace to build upon them so as to bring forth even more virtue on a supernatural level. Instead of looking at your greatest struggles and natural weaknesses, ponder, today, some of your greatest natural gifts. Examine how well you offer those gifts to God and use them for good. Don’t squander what you have been blessed with. Allow the goodness you have in your human nature to grow and blossom so that you will merit countless rewards from our merciful God. Dearest Saint Thérèse, you were blessed with numerous natural gifts from God. Among them was your humility. You did not allow the injustice you experienced in life to deter you from love and to leave you distressed. Pray for me, that I may discover the ways that God has blessed me on a natural level so that I may offer those gifts to God and allow Him to transform them into even greater perfection by His grace. Saint Thérèse, pray for us.